Paul Pogba's penalty and a first ever top flight goal from Luke Shaw earned the hosts the points, ​and put a smile back on the face of their manager. Leicester controlled large parts of the game in the first half after falling behind, but ultimately lacked a cutting edge against a resolute Jose Mourinho side. We could make this one all about Paul Pogba, but look down a little for that. Instead, we're going to try and put a positive spin on Manchester United's night, as it seems as though everything about the club in the past few months has been negative. Mourinho has cut a miserable figure all summer, but he'll have been pleased by some of the things he saw in this win. 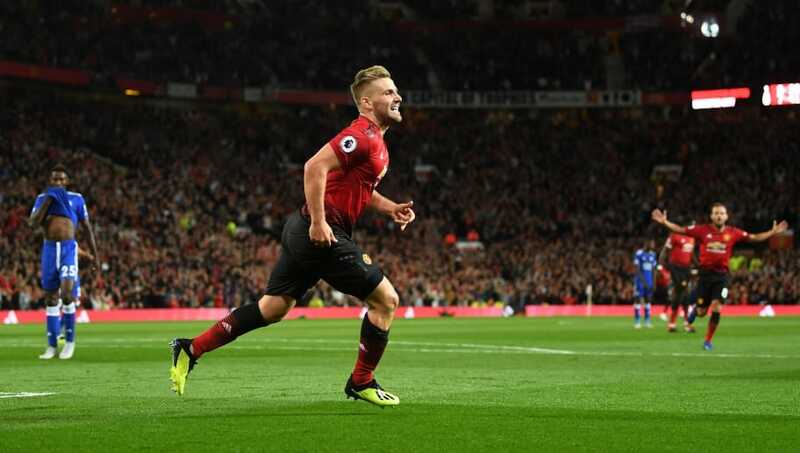 Pogba aside, the likes of Eric Bailly and Andreas Pereira particularly impressed, but you could see from Jose's reaction as Shaw netted the second that it's something he's really wanted to see for a long time. STAR MAN - Jose Mourinho wanted a captain. Jose Mourinho wanted the real Paul Pogba. Jose Mourinho wanted the World Cup winning Paul Pogba. And that's exactly what he got. There weren't many who could touch him in midfield on the night. And while United were starved of the ball for chunks of the first half, Pogba's calm and control settled everybody down when the hosts were in possession. Oh, and he took the best run up to a penalty we've ever seen on a football pitch. Here's how that went down on social media. It wasn't to be as United proved just a little too strong, but there were some positive signs for the Foxes - who looked like they could cause some trouble along the way this season despite the recent departure of Riyad Mahrez. Without him, their build up play was neat and tidy, and while they lacked that aforementioned cutting edge at times when they were on top, they'll surely get that back when Vardy is fighting fit again. But it looks like Claude Puel's side have spent the money received for Mahrez rather well this summer, and there's still a bunch of them to be drafted into the team. STAR MAN - James Maddison showed he can live with the best in the ​Premier League on his big debut at Old Trafford. He was a menace for the hour he was on the pitch and had his side's biggest first half chance. While he failed to take it, he showed that he's got a lot to bring to the table for his new side. This James Maddison dude is ballin out for @LCFC right now man. Unreal. United needed that win to bring back some positivity, and they got it. Mourinho will no doubt be happy that maximum points have been taken, and he should have a chunk of his World Cup players in a better condition for next weekend. ​Brighton await. Leicester next welcome ​Wolves, and will take plenty of heart from the performance they put in here. The Premier League is back, baby!